Do you need a space where your kids can play freely? Do you just want to have your own piece of paradise in your backyard? Look no further, Handy Gardeners can transform any outside area into a beautiful and highly effective landscaped garden! 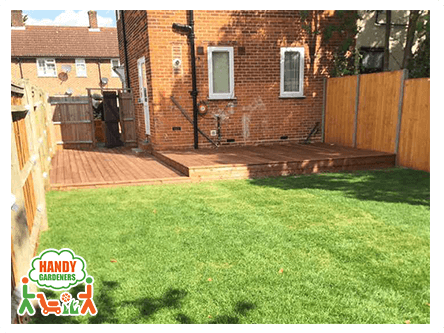 This is the exact case we want to bring to your attention with this amazing large-sized garden transformation we had completed for a happy client from Catford, SE6. Step 1. The Viewing. 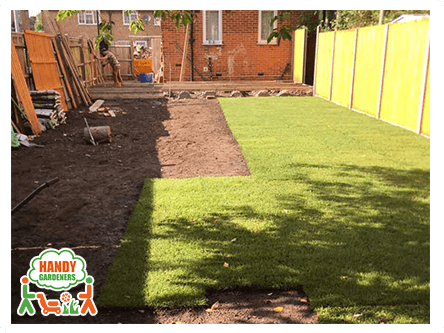 It turned out that our client from Catford had used our gardening service before but she wanted something more this time when she called us with the landscaping request. She explained that she wanted a complete transformation of her large-sized back yard. We sent a professional estimator to meet with her. 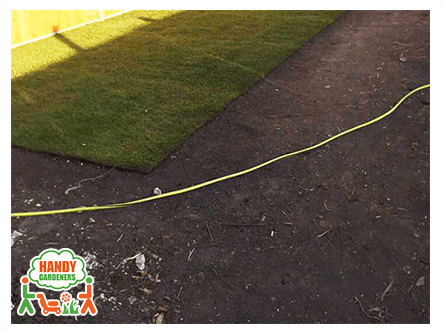 He took measurements of the whole space, discussed some ideas and suggested what would be the best solution and how we can create baby friendly garden, which was one of her main requirements. After we calculated the price, our client did not hesitate at all. She called back to book the landscaping project almost immediately. The project was completed in 10 days. Step 2. Garden clearance. 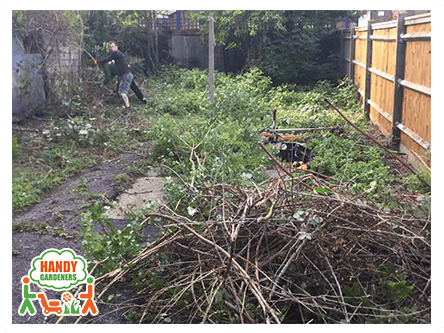 Before any decking to be built or turf to be laid, our professional gardeners had to clear the site completely. 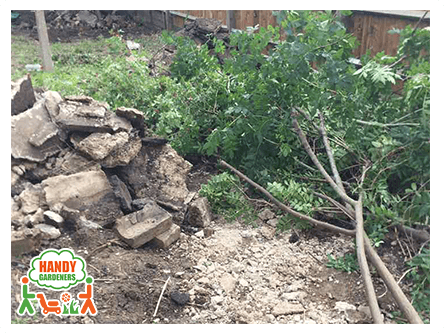 This included removing of an old grass, stumps, vegetation and roots. The area had to be prepared for the coming project. 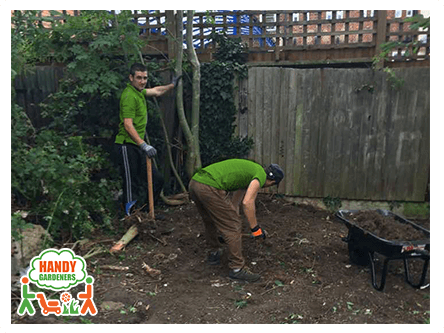 This step happened to be very time-consuming as it took our team more than a day to be completed, due to the large size of the garden and the existing cement that they had to remove. 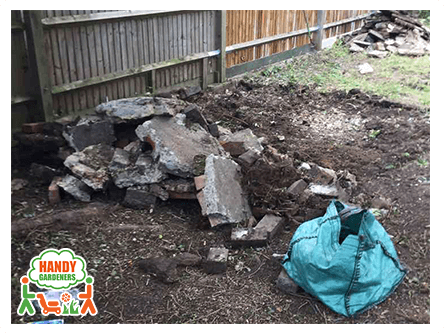 It turned out that the garden clearance was one of the most challenging tasks of this landscape project in Catford, SE6 as the cement was thick and it was really hard to remove it. All of the rubbish was disposed so they had a free space to work on. Step 3. New Fence Installation. 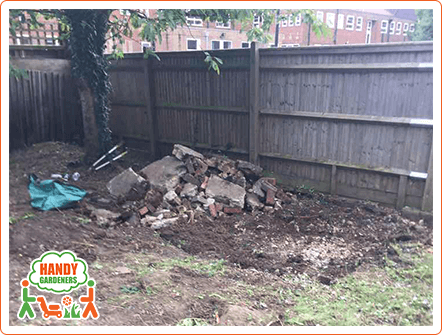 After the rubbish removal was completed our experienced landscapers proceeded with the installation of a new fence, which was 18 metres long and that consisted of 10 closeboard fence panels, 10 gravel boards and 12 wooden posts. 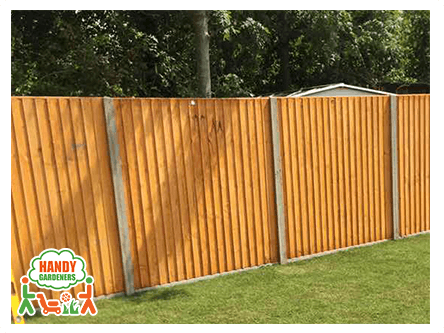 The team of gardeners removed the old fence first, after that they had to make new wholes for the posts, because the new fence panels were longer than the old ones, so the area should be adjusted prior to install the new fence. The fence installation itself took over a day as we wanted to make sure that everything was done to perfection prior to proceeding with the next steps of this multicomponent project. Step 4. Ground Leveling and other Preparation Work Prior the Turfing. 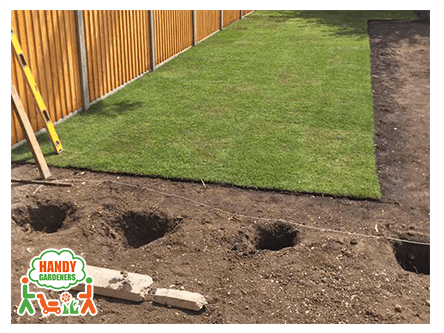 It was time to prepare the area to be turfed, so the landscapers had to level the soil and make sure that there would be no hollows or bumps in order to apply the needed top soil. Then it was followed by adding a thin aggregate layer of sand, which was leveled again, so the area was finally prepared for the grass laying. As we used finest quality Medallion turf, there was no need to apply any fertilizers or minerals prior to its laying or afterwards, as you can see from the pictures provided. Step 5. Turfing. On the fifth day, after all the preparations were completed, our team of landscapers could proceed with the laying of the natural grass on the designated area of 120 square metres. Even if the area wasn't small at all, our skilled landscapers finished with its turfing in just one day. The new natural rolls of turf were laid and edged where necessary. Step 6. 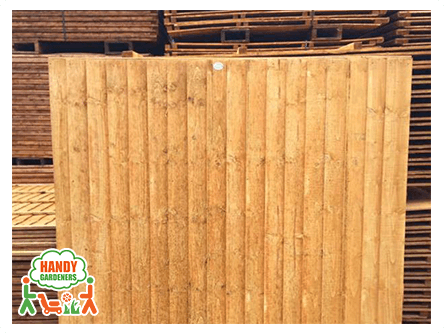 Decking Building. 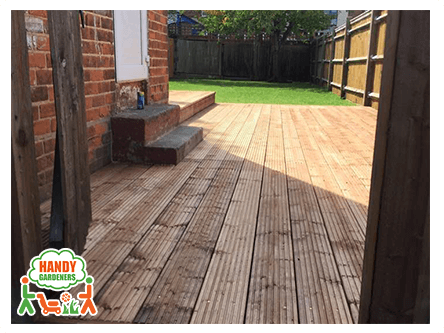 The last major step of completing this project was to proceed with building a new decking. The area designated for it was around 26 sq.m. 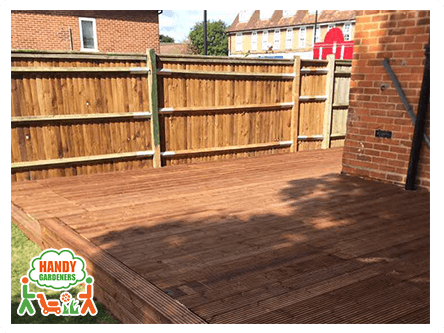 At the beginning, our client wanted the decking in her SE6 garden to be on one level, however during the process she decided to increase one part of the decking and make it on 2 levels. 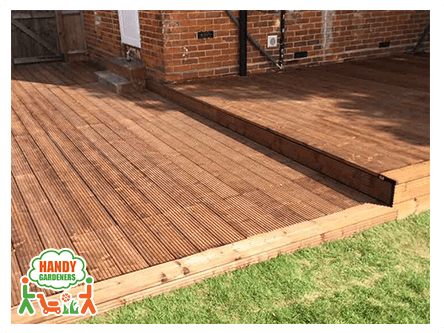 The building of the decking was a process consisting of few steps, including the creation of a wooden frame from treated timber that would protect it from water and forming the so called deck base that would start the actual decking. 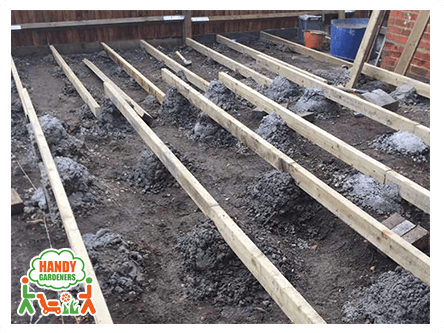 Then a sub frame was created and the decking was laid at the end. 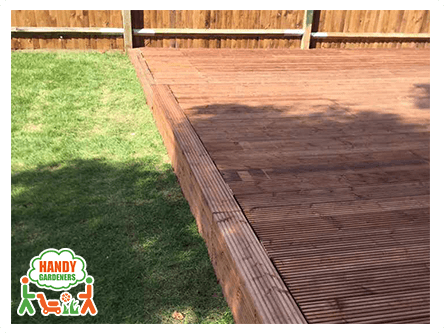 As you can see from the pictures, we used high quality soft wood decking that added up greatly for the improving of the garden aesthetics. On the last day, our landscapers made sure that everything was completed and left in perfect conditions. 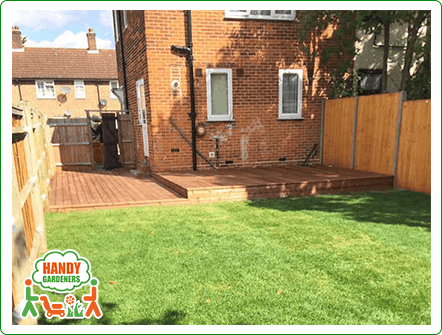 They also advised our client how to take care of freshly laid grass and newly built decking. Here is how we transformed the entire space into a baby friendly outdoor area where the whole family can gather and enjoy every season!